The Galapagos Islands are about 500 miles due west of Ecuador. To get to them, you have to fly into Quito, Ecuador's capital. Until very recently that involved one of the mot hair-raising approaches to landing at any major airport in the world. This is because Quito, at 9000 feet elevation, is the world's highest capital city. It is surrounded by the Andes mountains. And its old airport was right smack dab in the middle of the city, cheek-by-jowl with shops and apartments. This photo of Quito was taken from a cable car that takes you up one of the nearby mountains. You can see the runway of the old airport about a third of the way up from the bottom of the image. Part of me regrets never having experienced going in and out of the old airport, but part of me is relieved. The new airport has a lot more breathing room around the runway (though not necessarily in the terminal). 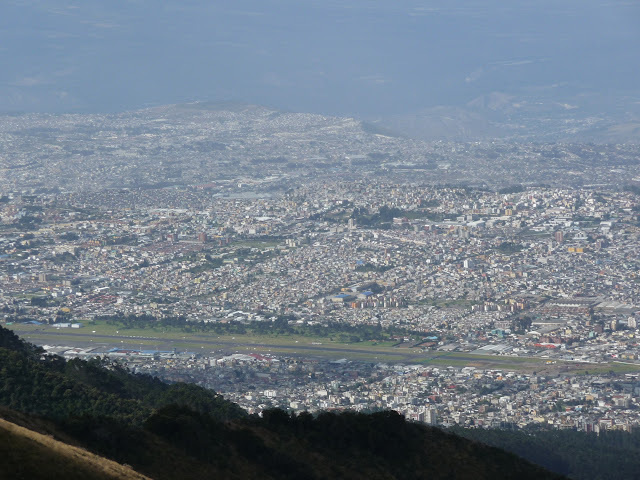 Quito is almost smack-dab on the equator (the city center is about 0.2 degrees south) so you might expect that it would be warm there, but it is also at 9000 feet and that helps keep the temperatures moderate. The day we arrived it was overcast and downright cool. 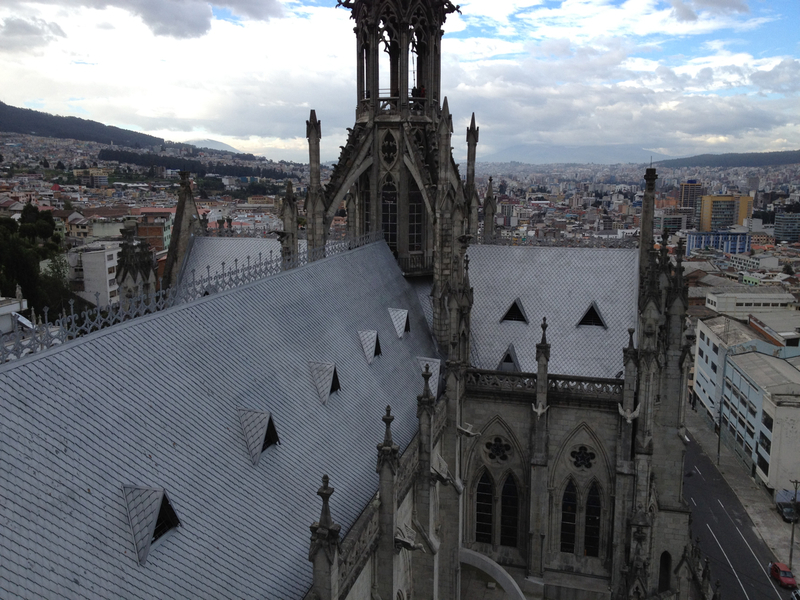 Quito has been experiencing an oil-money-driven revival recently, and the town is bustling. Unfortunately, the renovations have not yet extended to the city's fleet of diesel-powered busses, which spew incredibly thick black smoke out their tailpipes. When walking the streets, breathing is not recommended. But the people are friendly, the mountains are beautiful, and there's a lot to do and see. 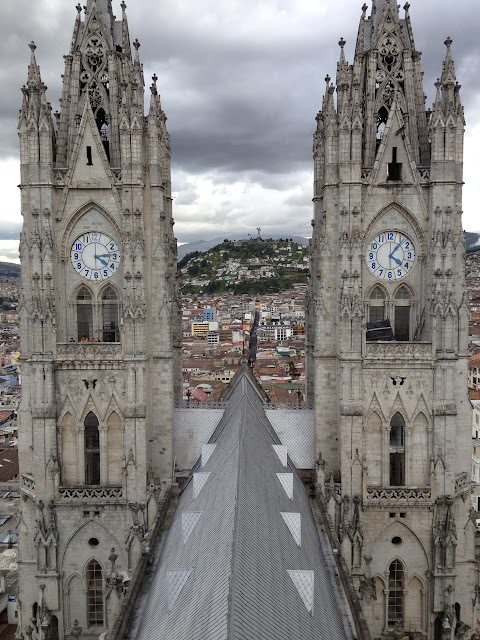 We were only in Quito for one day before we moved on to the Galapagos, so all we got to do was to walk around and visit the national basilica before we just couldn't take breathing diesel exhaust any more. But the basilica visit was quite worthwhile. You can go up into the towers, which involves climbing spiral staircases and ladders. 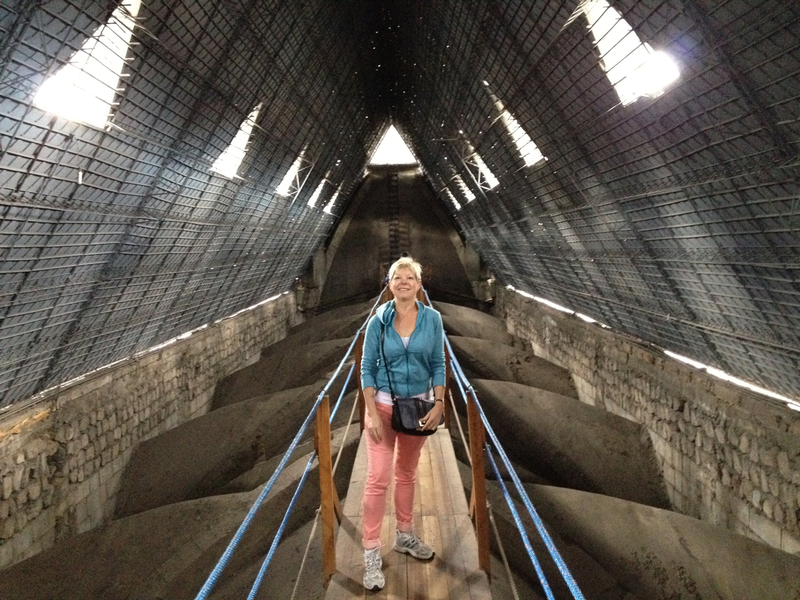 That's Nancy, standing in the space between the basilica's ceiling and roof. Behind her you can see one of the ladders that leads up to the towers themselves. OSHA inspectors would have conniptions. It is ironic that in a supposedly "free" country like the United States you could never have an experience like this, at least not without filling out a waiver, because of liability concerns. This photo doesn't really do the experience justice, but all I had with me was my iPhone (for reasons I can no longer recall I decided to leave my camera in the hotel). To give you some idea of how high up I am, the roof that you see at the bottom of this photo is the same roof that Nancy is standing under in the previous photo. Unfortunately, I'm not writing this travelogue in real time. There was no internet access on the boat. I've been back home for a few days now. But let me know if you're ever in California.